The 2017 Bresler Resident artist, Maria-Theresa Fernandes delved into the history of Rockville during her four month Bresler Residency. She found inspiration in textiles and newspaper archives from the Beall Dawson House collection, as well as the Confederate soldier statue currently boxed in plywood while it waits to be moved from the grounds of the old Rockville courthouse. Fernandes brilliantly embodies historic facts and narratives in her new body of textile and stitched works. About the artist: Place, travel and environment play an important part in fiber artist Maria-Theresa Fernandes’s internationally acclaimed work. Throughout her career, travel has given her the opportunity to reflect and create works relating to the surroundings of the countries she experienced. History and poetry are brilliantly woven into the fabric of Fernandes’s works, which translate her physical and emotional attachment to the lands she visited. Born in Kenya, Fernandes studied in London and Manchester, England. She received her B.A. (Hons) degree in Textiles with a specialty in Embroidery. The United Kingdom is the only country to confer this degree. A graduate from Cranbrook Academy of Art in Detroit with a M.F.A. 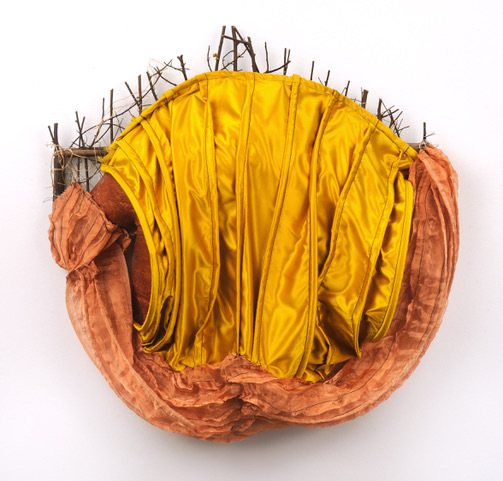 in Fiber Art, Maria-Theresa Fernandes has participated in over 25 solo exhibitions and several international exhibitions. This global artist is the recipient of prestigious international grants and awards and such as the Pollock-Krasner Foundation grant, the Ruth Cheven Foundation award, and the UNESCO –Arts International award. About the Fleur and Charles Bresler Residency: In honor of VisArts patrons, Fleur and Charles Bresler, VisArts invites applications and proposals from local, national, and international artists for a four month residency at VisArts at Rockville. This residency provides a unique opportunity for a dynamic individual artist or collaborative artist team to create a new body of work, evolve an existing body of work, or develop a project in a stimulating, supportive environment. Studio space is provided free of charge. The residency encourages interaction, dialogue and exploration both within the VisArts artist community and the larger Rockville community as well. The residency offers the gift of time and space to three artists and/or collaborative artist teams each year to experiment and realize new work. The current Bresler Resident Artists present their work in a solo exhibition at VisArts. For more info, click HERE.